For healthy eating avoid packages. Increasing urbanization and modern lifestyle have led to substantial changes in eating habits of the population, especially in Western countries. The longer time spent in the home of commuting to work and back is offset by a shorter time to carry out the meals. If, previously, in small communities, all the meals were made and prepared at home, these days it is rare. 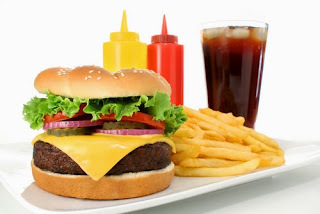 To meet this new demand reality of fast foods and practices there was a large growth of the food industry ready or pre-made, so-called processed foods, packaged in the most diverse patterns. In addition, there was also a proliferation of restaurants and eateries, as well as sale service fast foods in large supermarket chains. The technology, in turn, contribute to the microwave oven, which allows the heating or cooking of prepared food or pre-prepared in shorter times. However, this change in eating habits cause side effects and costs of these events are generally charged on the health of the person. One of the major negative consequences of this type of feeding with respect to excess sodium intake (contained in the salt), because there is a direct and positive correlation between this excess intake and increased blood pressure. Hypertension (high blood pressure) is one of the main risk factors for a number of diseases (heart disease and strokes) which are the main causes of death - including early deaths - today. The United States is certainly the country champion in food consumption industrialized and recent data indicate that more than 90% of American adults consume more sodium than recommended. A recent study in the country and published in the journal Preventing Chronic Disease this month of April, assessed the salt content of processed foods sold in supermarkets. It was found that over 50% of food sold in packages have a lot of added salt, higher than recommended as healthy amount by the Control Center for Disease Prevention, which is the body that sets guidelines for healthy food consumption. The sodium intake considered healthy, ie without potential effects on blood pressure, is of 2.3 grams of sodium per day for adults up to 51 years. For people over 51 years, or any age who already have hypertension, diabetes or chronic kidney disease and Afrodescendants, this value is 1.5 grams / day. Whereas a little pot of soup ready or fastfood sandwich containing 2.2 g of sodium, it is difficult to maintain a healthy diet with these foods being ingested systematically and not only "occasionally". The authors also call attention to the important fact that most of the sodium consumed by the population come from food restaurants and processed foods (processed) sold in packages. Both may contain an excess of sodium. It is estimated that today only 25% of sodium ingested by a person that is added to the cooked food preparation (either during preparation or after the preparation), and 75% comes from processed food purchased ready-made or pre-prepared in packs. With this food environment grows the difficulty to achieve is a healthy sodium intake.